One of my favorite street food style Vietnamese dishes is bánh lọt xào – a simple stir fry of rice noodles, eggs, and a molasses-based “thick soy sauce.” The flavor profile bears resemblance to bánh bột chiên, a Vietnamese pan-fried rice cake similar to the turnip cake served at dim sum restaurants. There are only a few ingredients involved, so if you have the fixins on hand, this could make for a very quick meatless dinner! 1. 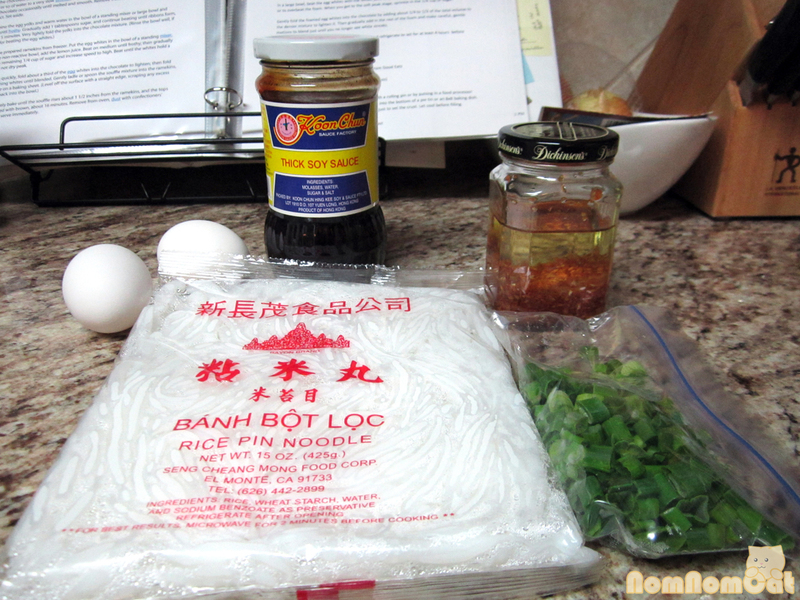 Bánh Lọt: The namesake of the dish, these noodles are readily available at Asian grocery stores that stock freshly made rice noodle products, tofu, soy milk, etc. They can be found next to the hủ tiếu (wide, flat rice noodles) packaged in clear bags like in the photo below. 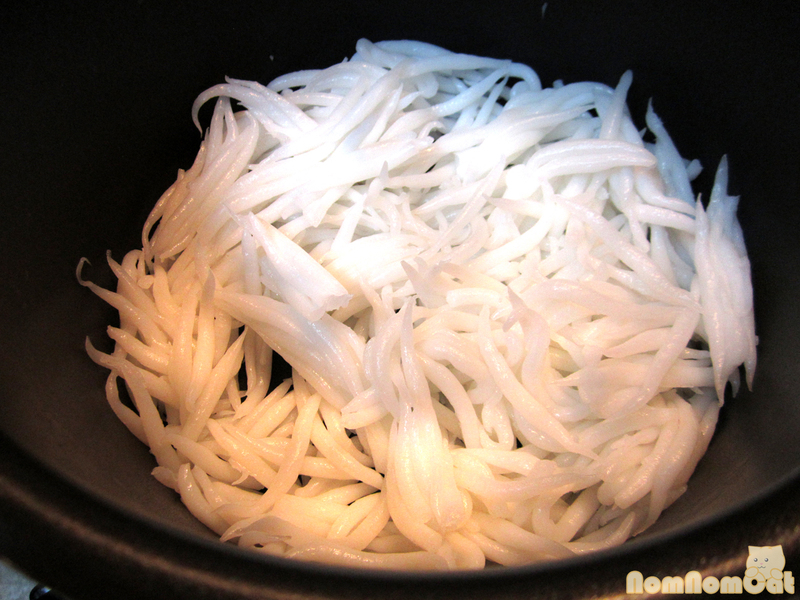 The brand we purchased hails from El Monte, CA and is labeled “rice pin noodles,” after their tapered shape. If you have difficulty finding these, you could substitute fresh (or dried and reconstituted) phở noodles, thus making phở xào. Alternatively, you could stop by a Korean grocery store and get a package of duk (떡), round discs of rice flour cakes (although I would blanch them first to soften). 2. Thick Soy Sauce: Definitely not the “soy sauce” that typically comes to mind, thick soy sauce is made of mostly molasses and is a very viscous, dark colored fluid. I buy the one from Koon Chun which is also a popular brand for hoisin sauce, but be sure to read the label! I’ve been known to accidentally buy the wrong product… all of their jars have the same yellow labels and differ only in the text (all written in the same red capitalized letters). If your noodles were in the refrigerator, pierce the packaging and microwave for 1-2 minutes to help soften (and separate) the noodles. If your noodles are fresh from the store, skip this step. In a large pot (or wok), heat the oil on medium-high heat and saute the garlic. If using pre-made garlic oil, make sure the garlic bits do not get too dark. 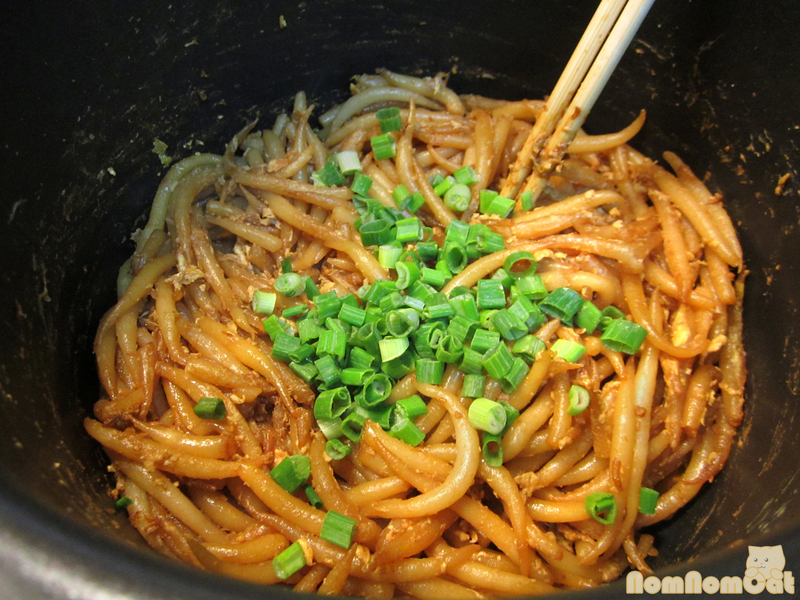 Toss in the noodles and stir vigorously to separate. 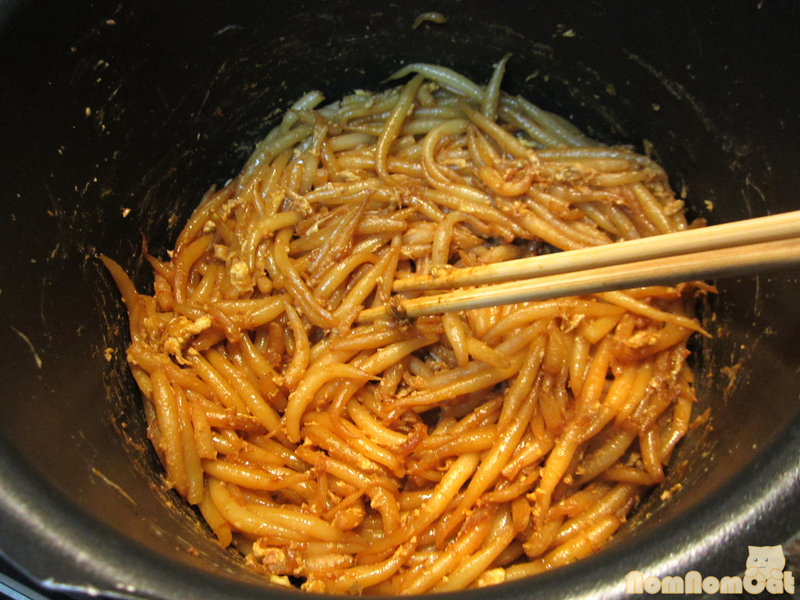 Drizzle in the thick soy sauce, keeping the noodles moving so the molasses does not burn. I usually just crack the eggs directly into the pot and stir to mix, but you could also beat the eggs in a small bowl first and then add them to the noodles. 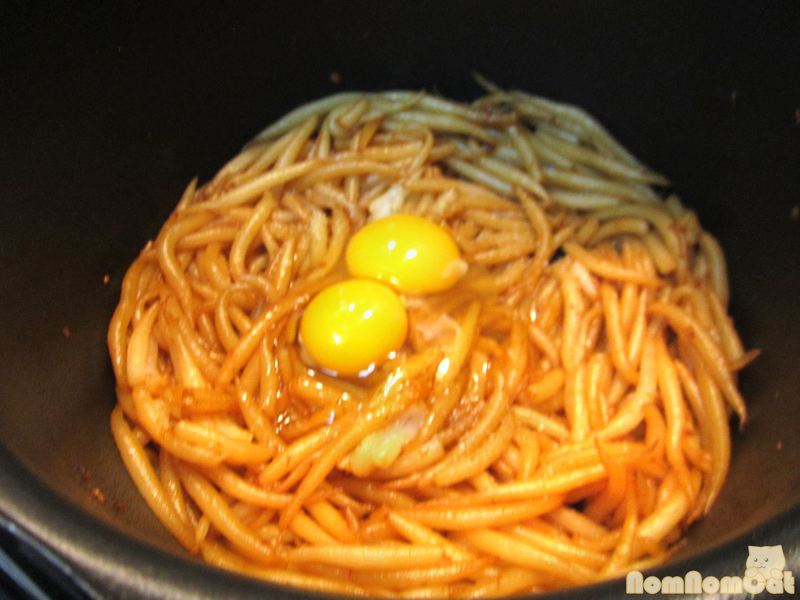 Stir to combine and coat the noodles in egg. Grind in some fresh cracked pepper and sprinkle with soy sauce or seasoning sauce. 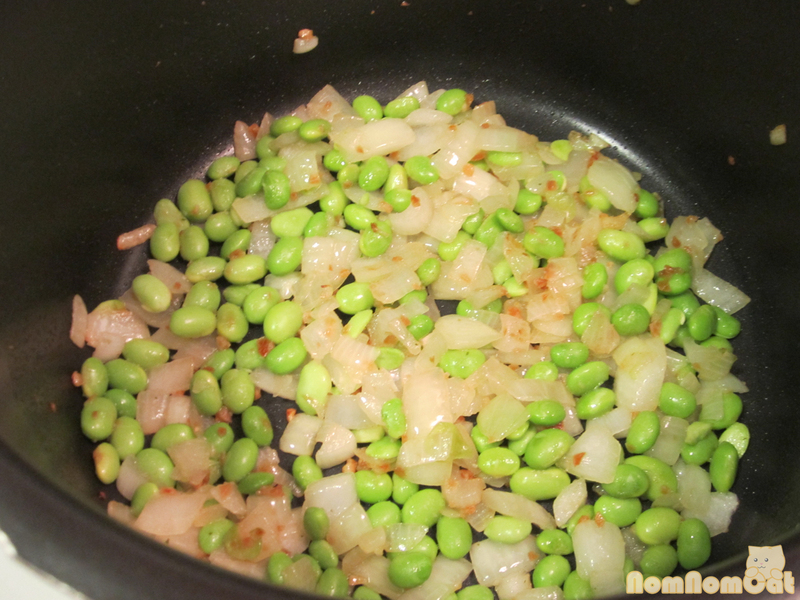 I also like to sprinkle in a bit of garlic salt for extra flavor. It’s OK to prepare this a bit under-seasoned so the diner could season to taste. 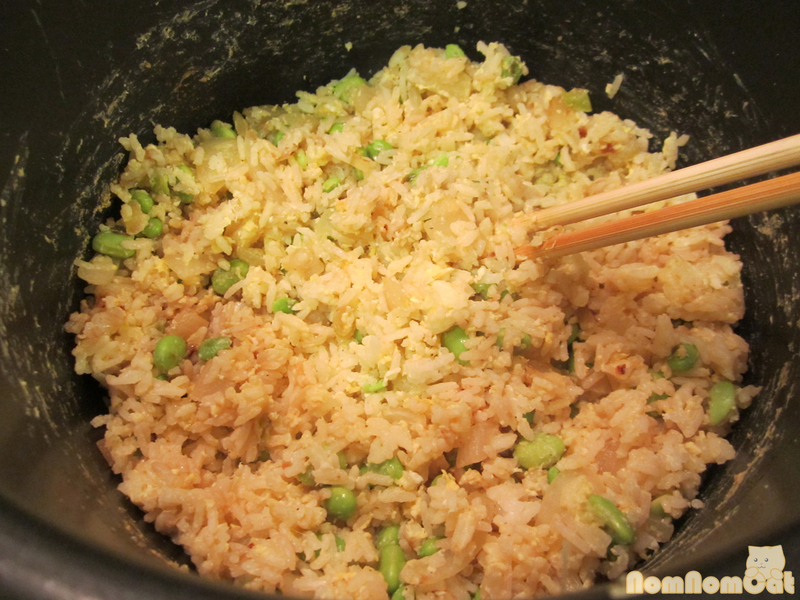 Add the chopped green onions. You’ll want to just wilt them. When the moisture from the eggs has cooked off, remove from the heat and serve. You could whip up a quick “sauce” of soy sauce and sriracha for a spicy kick to serve alongside the noodles. 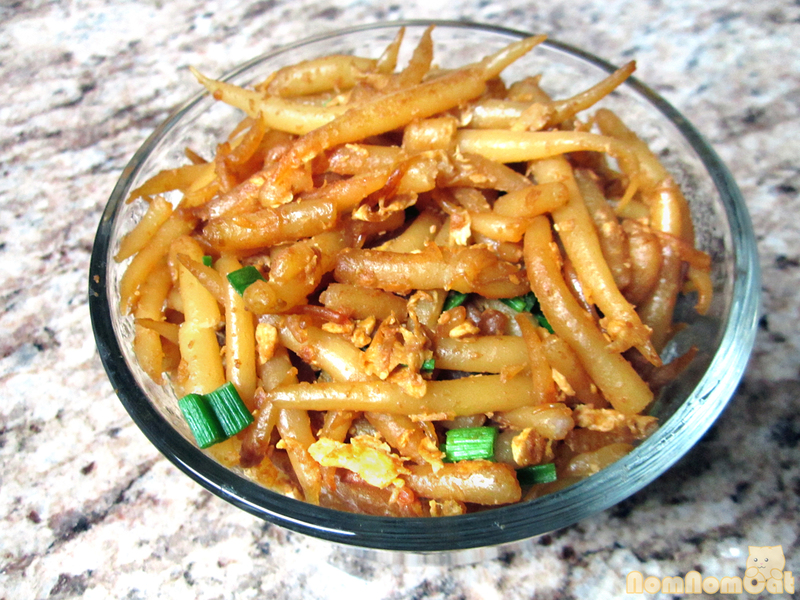 Optional: bánh lọt xào is often prepared with bean sprouts. Martin isn’t a big fan so we did not include them here. If you plan to use them, be sure to pluck off the roots and rinse the sprouts in cool water. 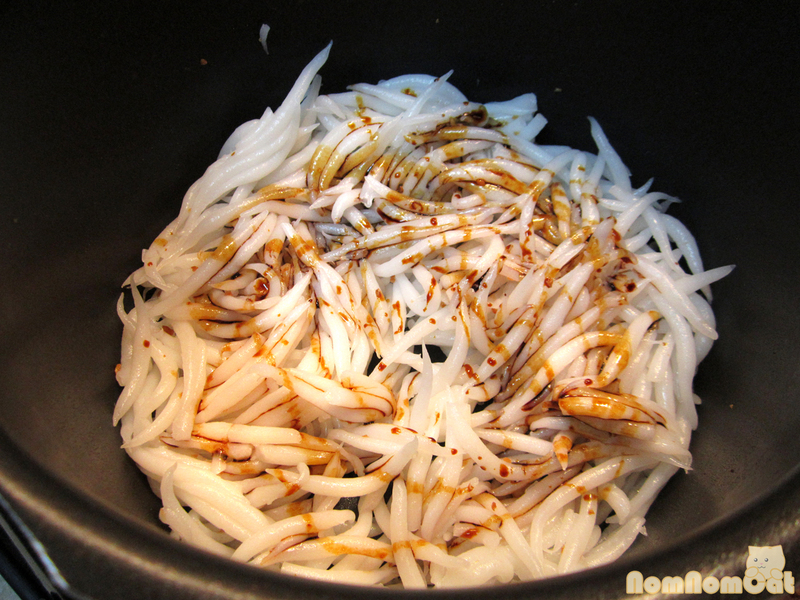 Drain well and add them at the beginning when you first toss the noodles with the oil. I love the chewy texture and fun-to-eat shape of the bánh lọt, and I enjoy making this dish at home as it can be too greasy when prepared at Vietnamese-Chinese restaurants. This quick and easy recipe is also a great way to participate in Meatless Mondays (although you could easily add some slices of beef, chicken, or even seafood for endless variations on this dish). Enjoy! Soufflé. French for “breathed” or “puffed,” this classic, notoriously difficult dish can send shivers through a chef’s spine. 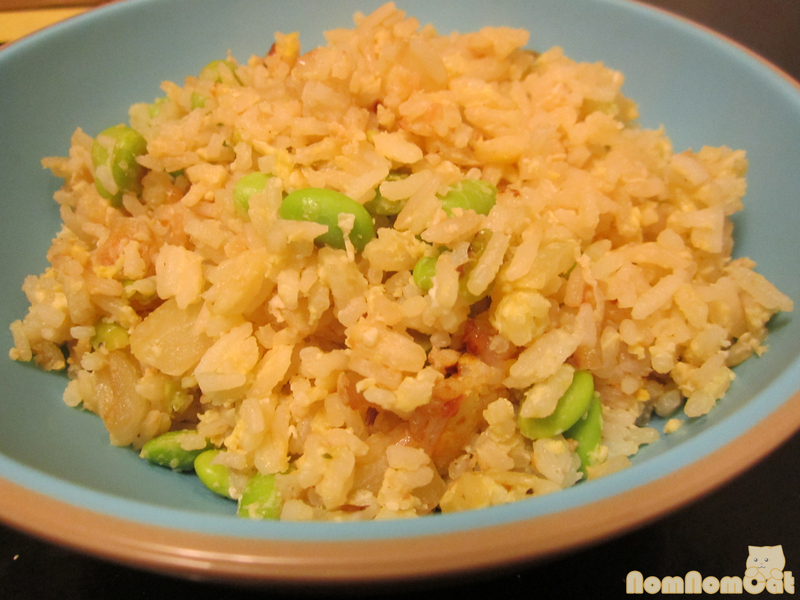 As our friend over at Bunny Eats Design puts it, it is the home cook’s nemesis. I’ve always wanted to make a soufflé. After watching countless movies and TV shows, I wanted to be that person pulling a beautifully risen soufflé out of the oven. Not going to lie, the “Asylum of the Daleks” episode of Doctor Who with Jenna-Louise Coleman as Souffle Girl played a pretty big part in influencing that desire. So I set to work, combing the internet for recipes and diligently reading up on the eggs chapter of McGee’s On Food and Cooking: The Science and Lore of the Kitchen. Coincidentally, Martin requested a soufflé for his birthday, so that was the deciding factor for me to pick up my whisk and carpe soufflé (hm, that combination of Latin and French worked better in my head…). Here’s a shot that really shows the height of its rise. Though I consulted On Food and Cooking for most of the technique, I have to credit Food Network Kitchens for providing a starting point for figuring out the proportions of ingredients (although I did end up making some adjustments). Our kitchen just happened to be perfectly prepared to handle this daunting task, so read carefully, plan well, and take inventory of your equipment. This is going to be a long post, so please bear with me. 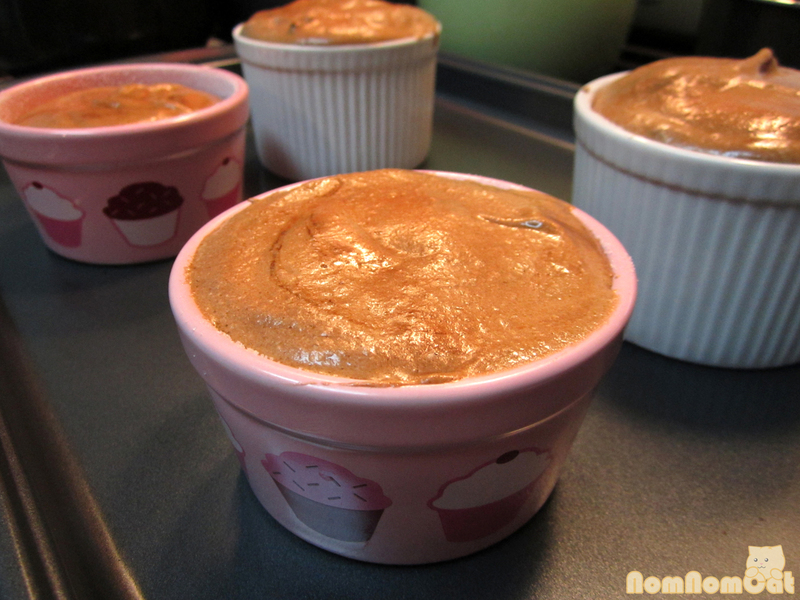 Using these proportions, I was able to fill 2 smaller (4 oz-ish) ramekins and 2 standard 6 oz ramekins. Preheat the oven to 400 degrees. According to On Food and Cooking, this will yield the quickest and most dramatic rise, but also a faster collapse. I opted for this because I prefer my soufflés lighter and more airy; low and slow will yield more of a lava cake consistency and a less dramatic rise. 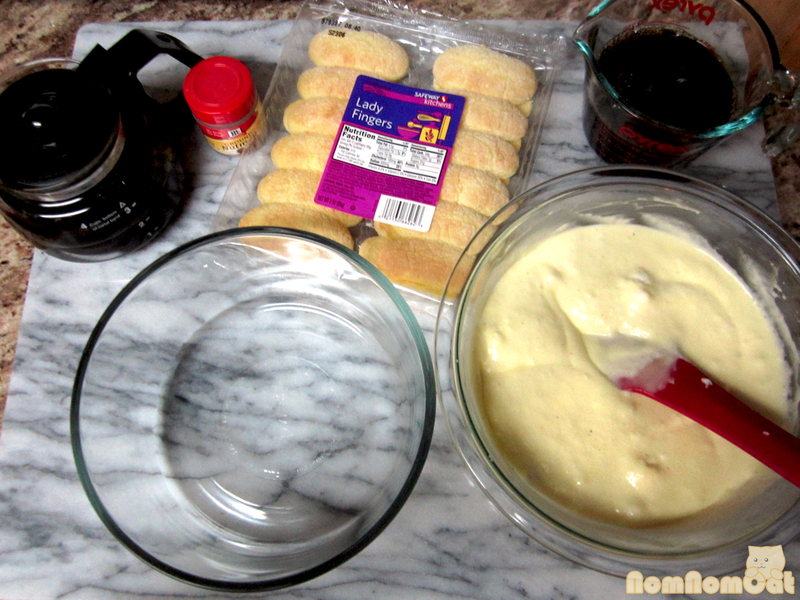 1) Prepare the ramekins by buttering the base of the ramekin all the way up the sides. I used a scrap of paper towel and some softened butter that had been sitting on the counter. 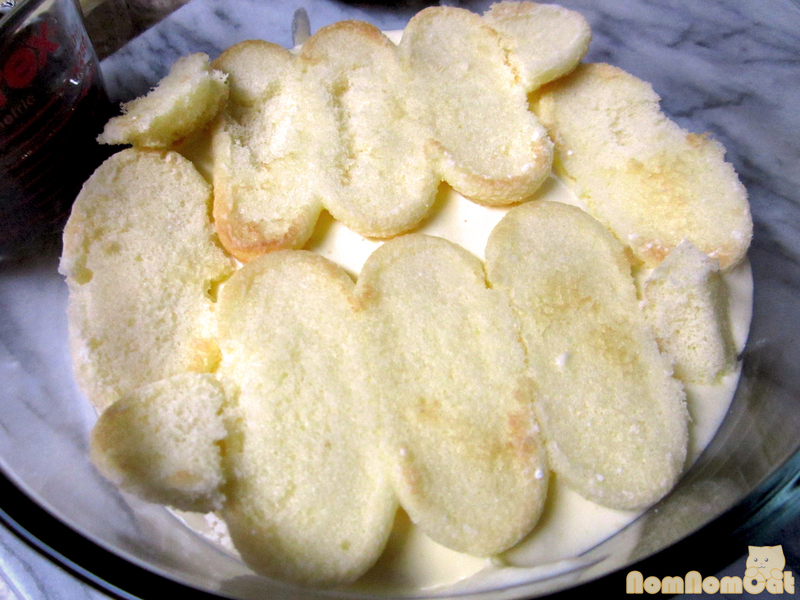 Coat the buttered ramekins with sugar. 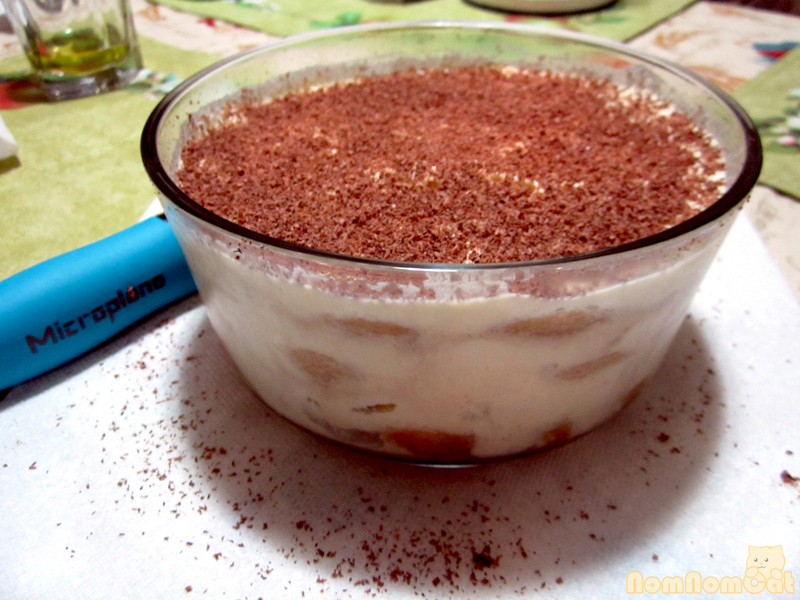 I read a trick online to minimize mess: add a spoonful or two of sugar to the ramekin. 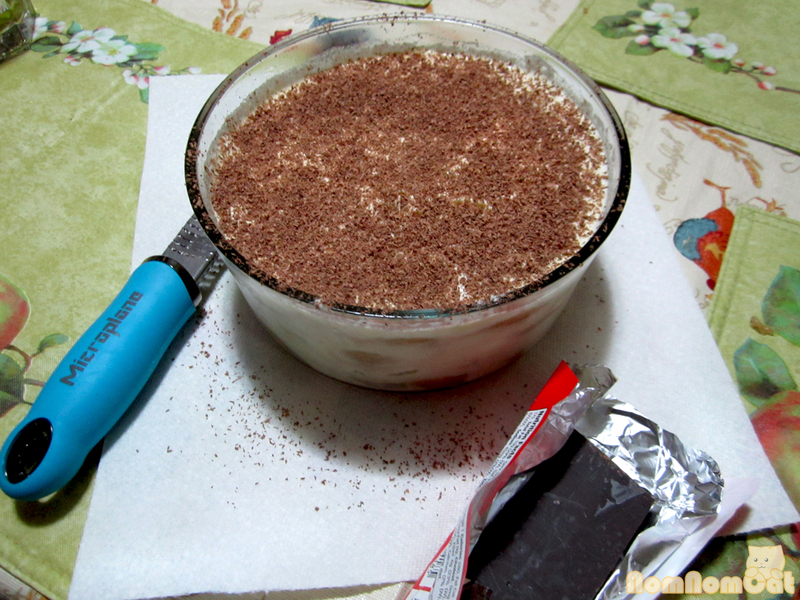 Cover tightly with plastic wrap and shake to get all of the sides evenly coated. 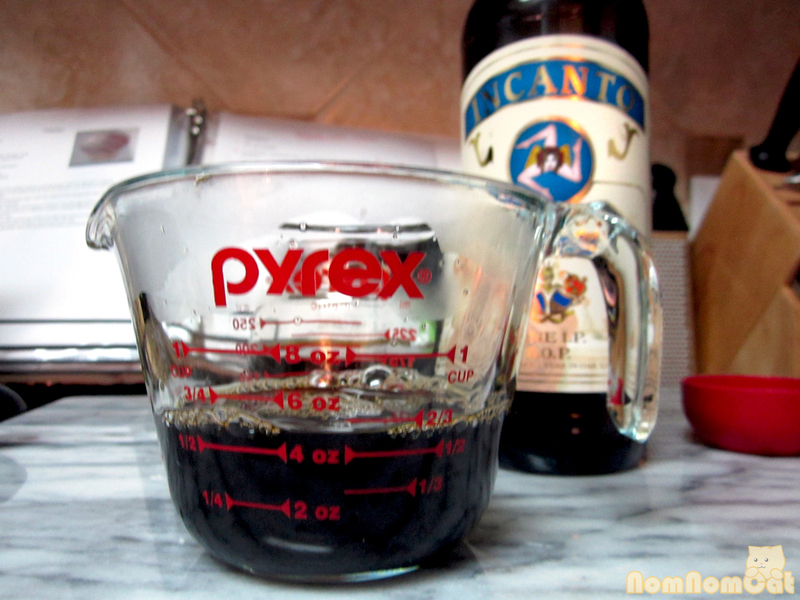 Shake out the excess into the next ramekin and continue the process. Some recipes say to freeze or refrigerate these prepped ramekins. I left them out on the counter and achieved fine results. 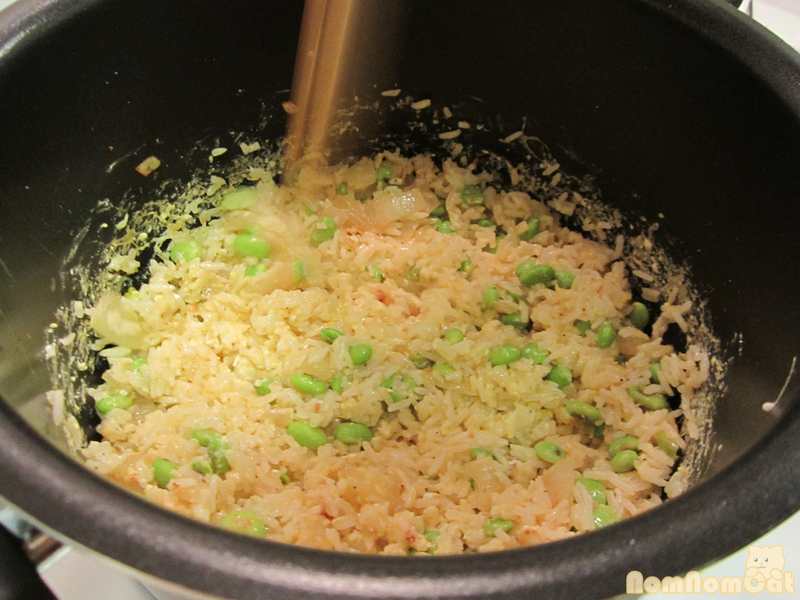 2) Create a double-boiler by bringing about 1 inch of water to a simmer in a small saucepan. 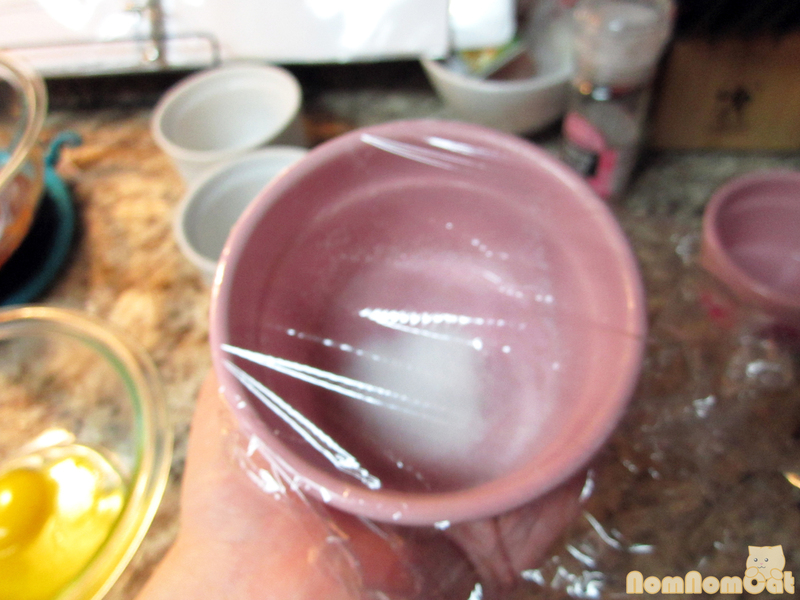 Place a heat resistant bowl (like a Pyrex) inside, making sure the bottom does not touch the water. 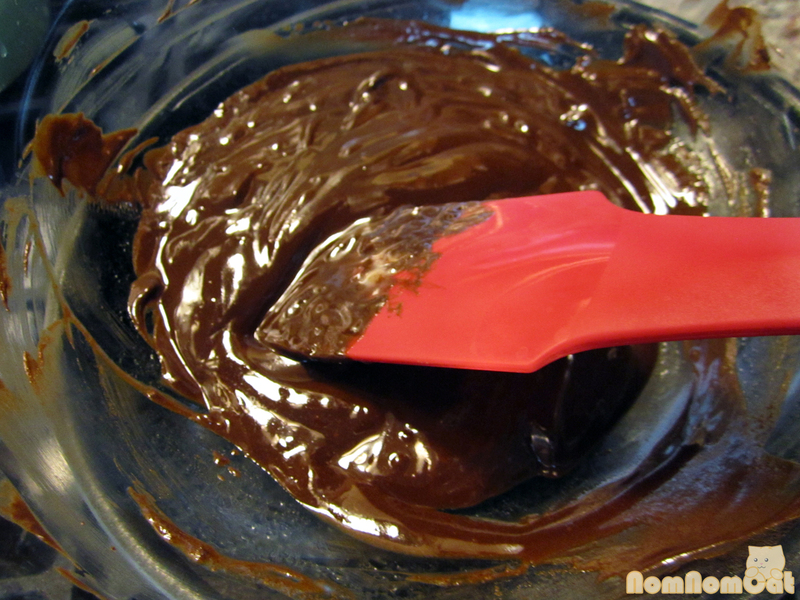 Melt the chopped chocolate with the butter.A silicon spatula is helpful to stir and scrape down the sides of the bowl, ensuring the mixture blends smoothly. 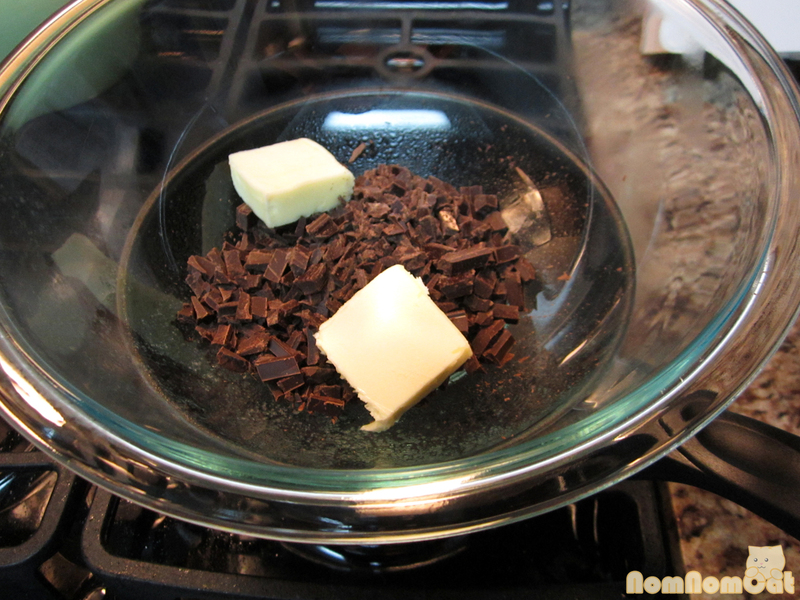 When the mixture is completely smooth, take off the heat and stir in the vanilla. Set aside for later. 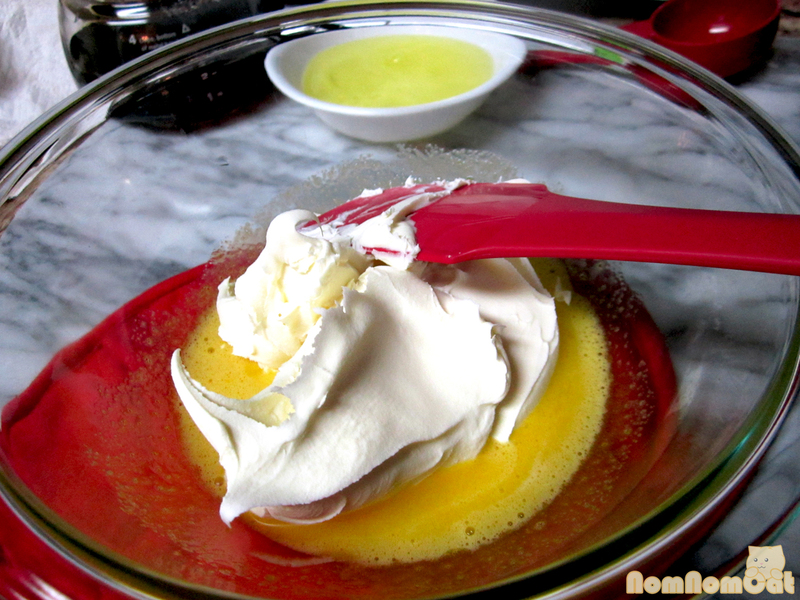 3) Whisk the egg yolks with the warm water in a small bowl until frothy and pale yellow. Sprinkle in the 1 tablespoon of sugar and continue whisking until it reaches the “ribbon stage,” so named because a lifted whisk will cause the mixture to cascade down in a ribbon-like pattern. 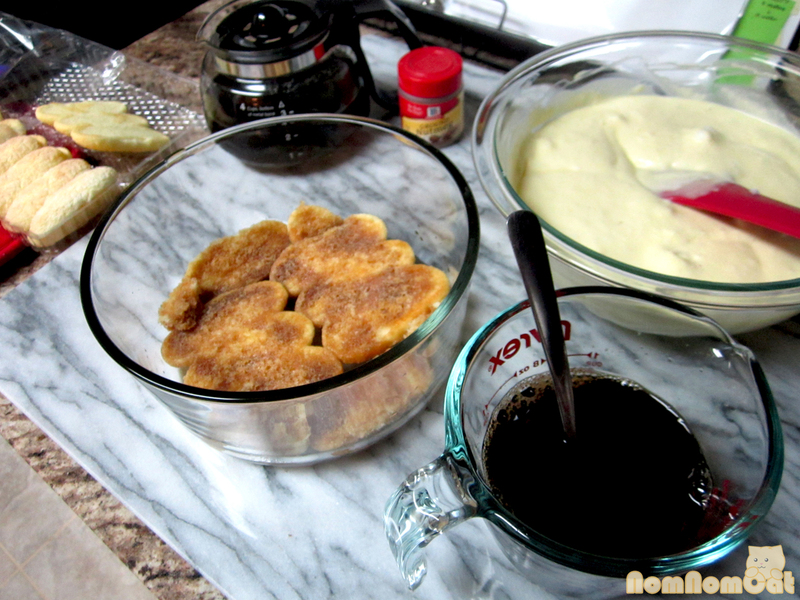 This will take about 5 minutes from the time you add in the sugar. 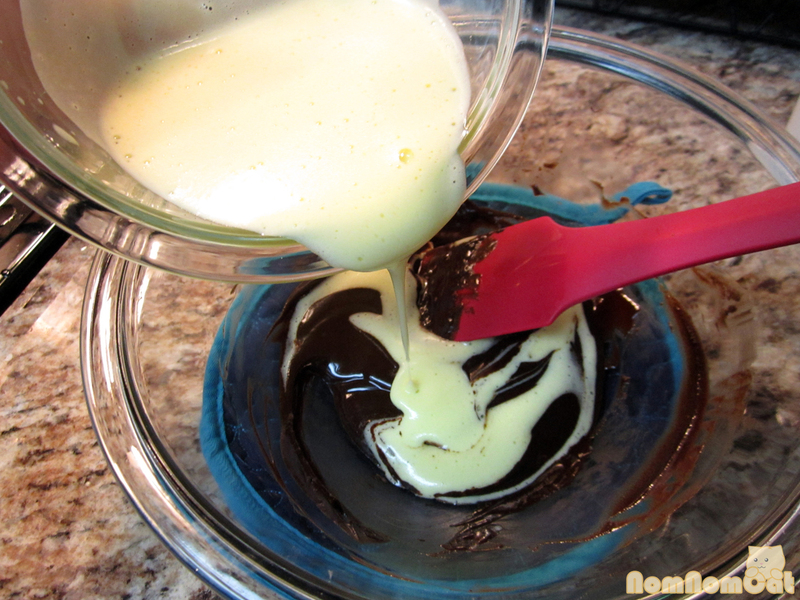 4) Fold the egg yolk mixture into the melted chocolate, mixing gently. I drizzled the egg mixture into the chocolate rather than dumping it in all at once. I think this helped to keep some of the yolk froth. 5) Time to foam! 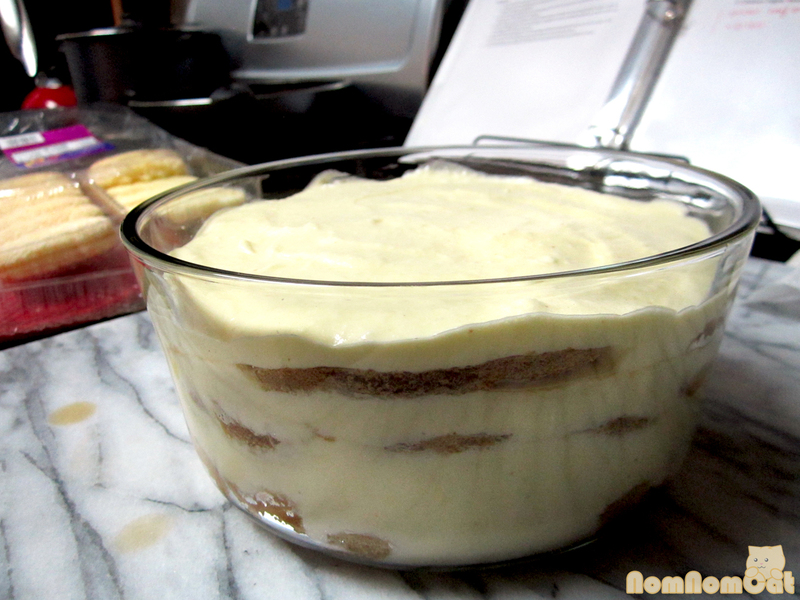 Take out your largest Pyrex (or other non-reactive) bowl; add the egg whites and lemon juice. Grab a NEW whisk or wash the first one very well. Any trace of egg yolk and the whites will not whisk up properly. 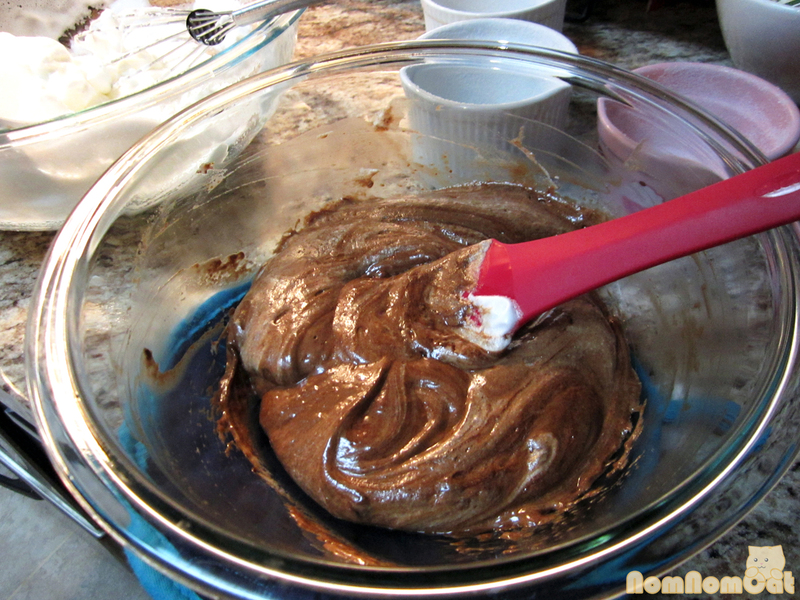 Whisk away to get it started; then add in the sugar and continue whisking. I did this by hand, and it took about 10-15 minutes of vigorous whisking to get the stiff but glossy peaks that you’re looking for. Phew! What a workout. 6) Now it’s time for more folding. Some people say to work quickly but I heeded the advice of On Food and Cooking and worked gently instead. 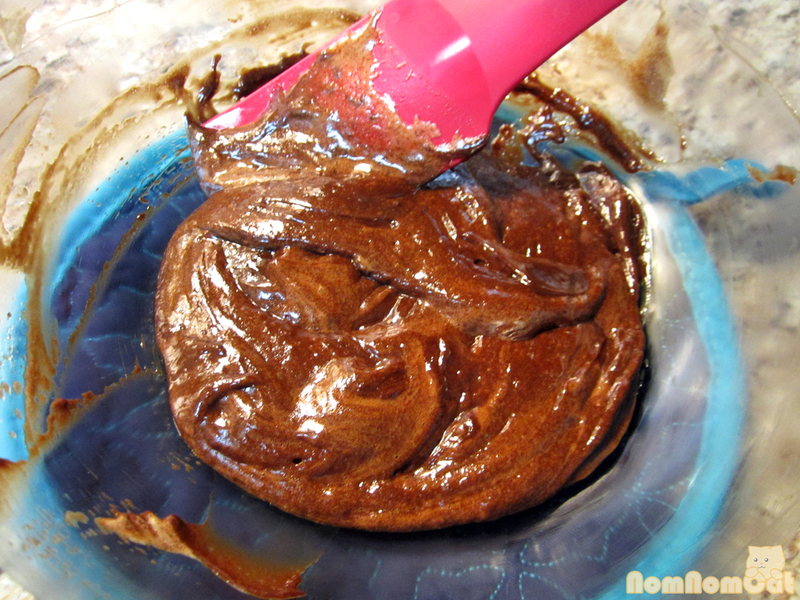 Spoon about 1/4 to 1/3 of the foam onto the chocolate mixture and gently fold to lighten. 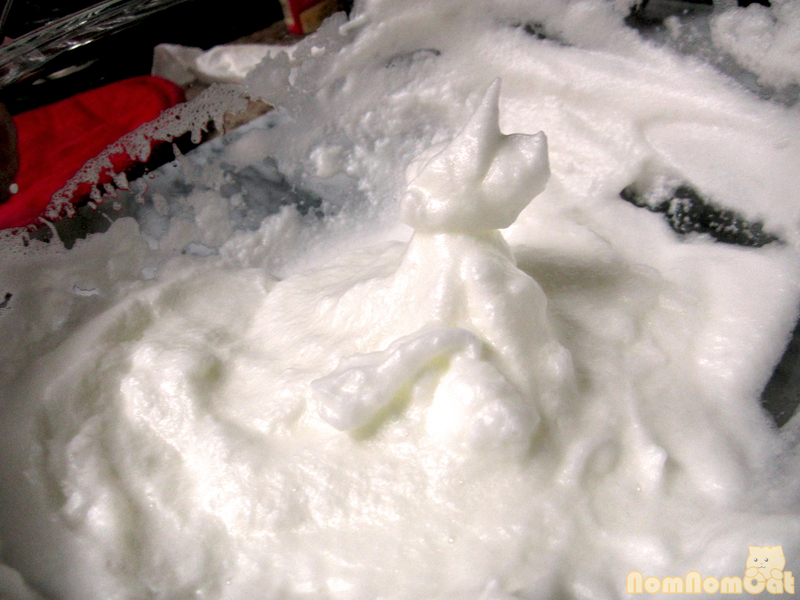 Add about half of the remaining foam and continue to fold, using as few strokes as possible. Then finish up the foam and fold. I’ve read that if you have to make the choice between white streaks and over-mixing, it’s OK to have white streaks. 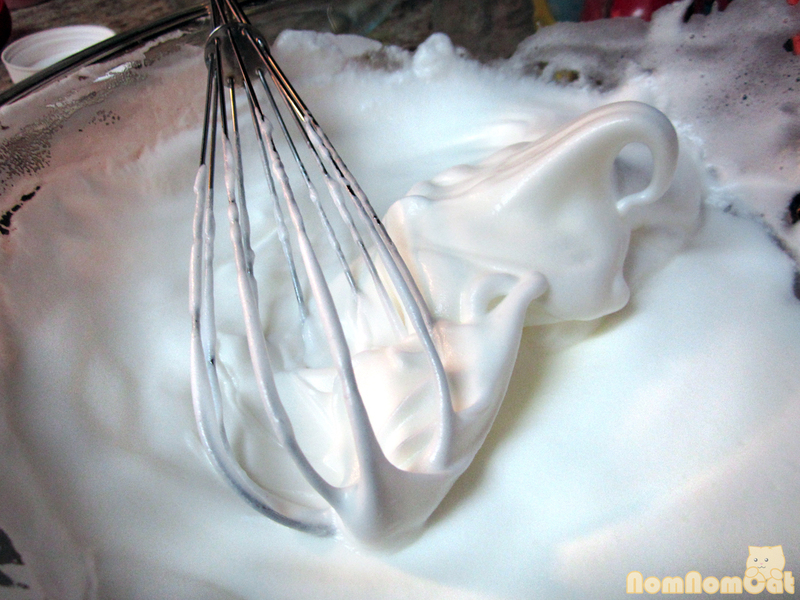 Too much or too vigorous mixing will lose a lot of your hard-earned voluminous foam. 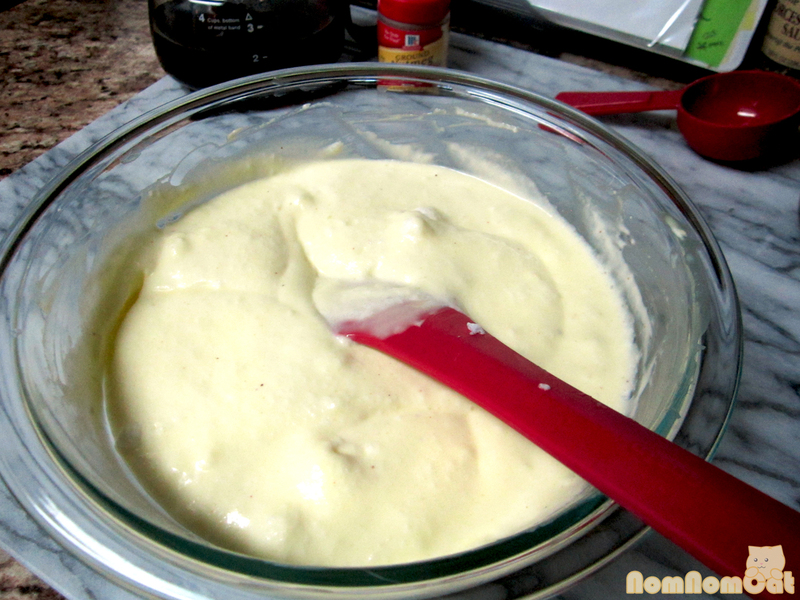 7) Spoon the soufflé mixture into your prepared ramekins. 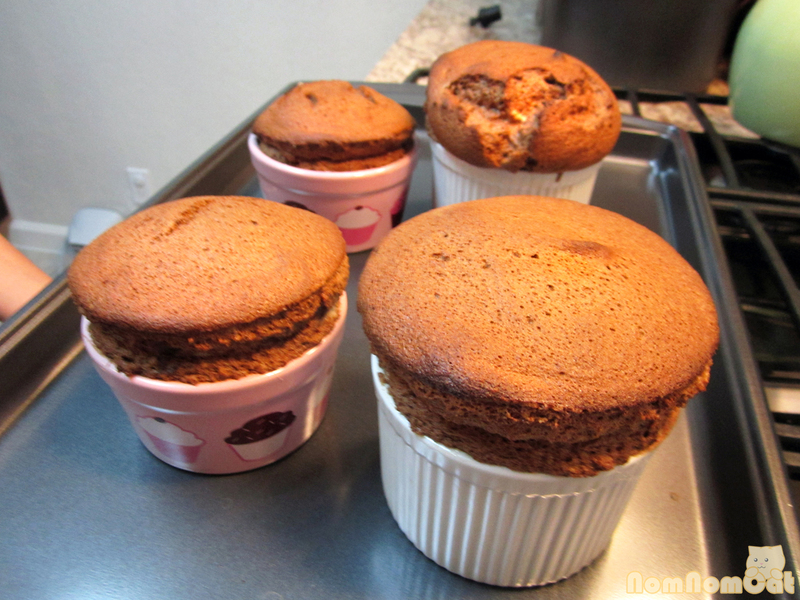 Apparently, the cocoa strengthens the bubble walls so this souffle mixture, while it seems delicate, is actually quite resilient and could keep in the fridge for a few days or in the freezer indefinitely before its bubbly integrity deteriorates. I personally didn’t chance it. 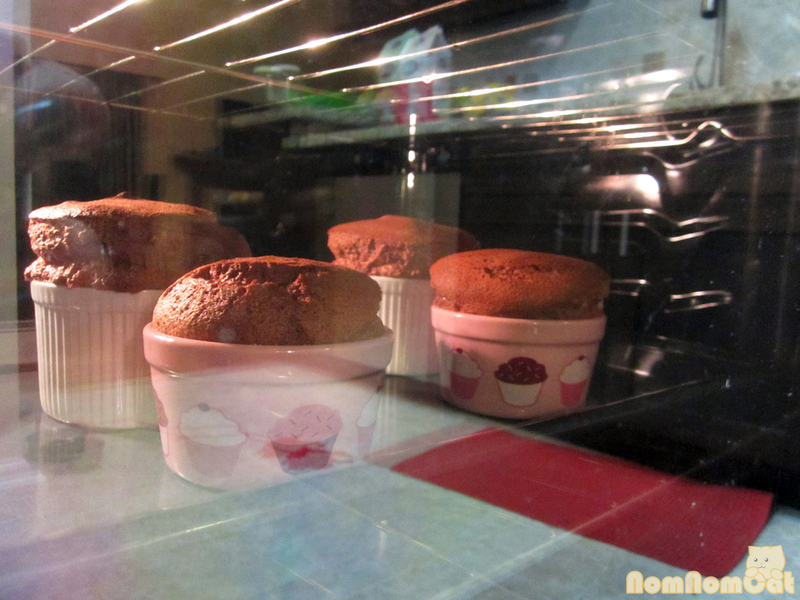 Place the ramekins onto a baking sheet and slide them onto a rack situated in the bottom 1/3 of the oven. 8) Bake at 400 degrees for about 15 minutes or just as the tops start to brown. 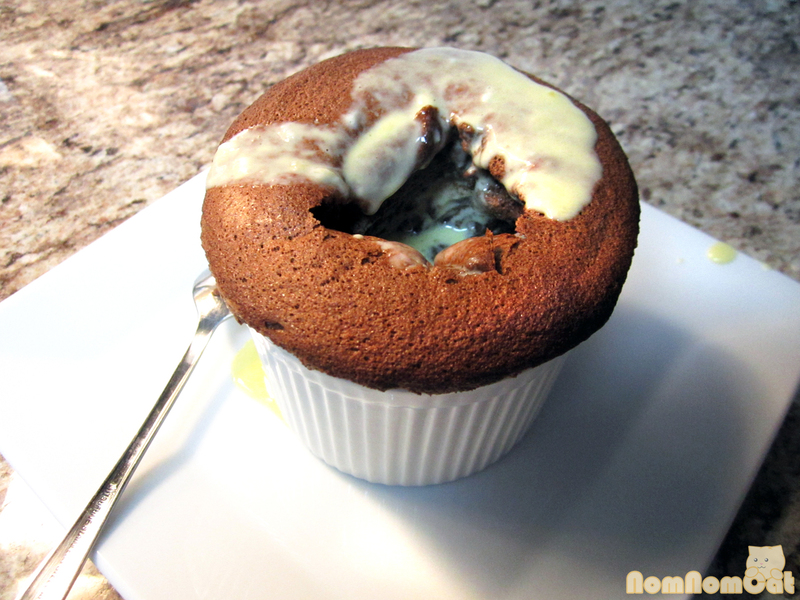 Contrary to popular belief, you CAN open the oven without ruining the soufflé. It is the heat that causes the air bubbles to expand and loss of heat that causes the collapse. Still, I left well enough alone and was grateful for my glass doors through which I could keep a watchful eye. 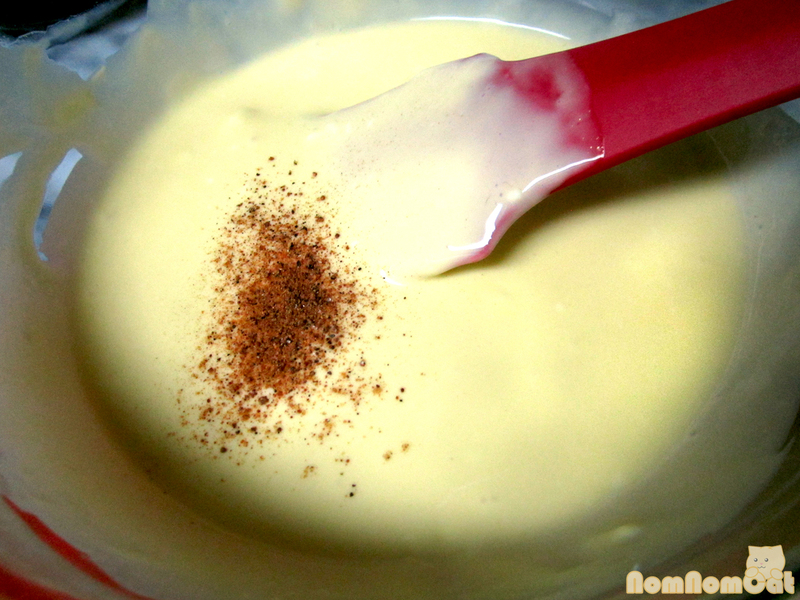 9) If preparing a crème anglaise, you’ll have just enough time to do this now. Bring the cream and vanilla to a simmer. 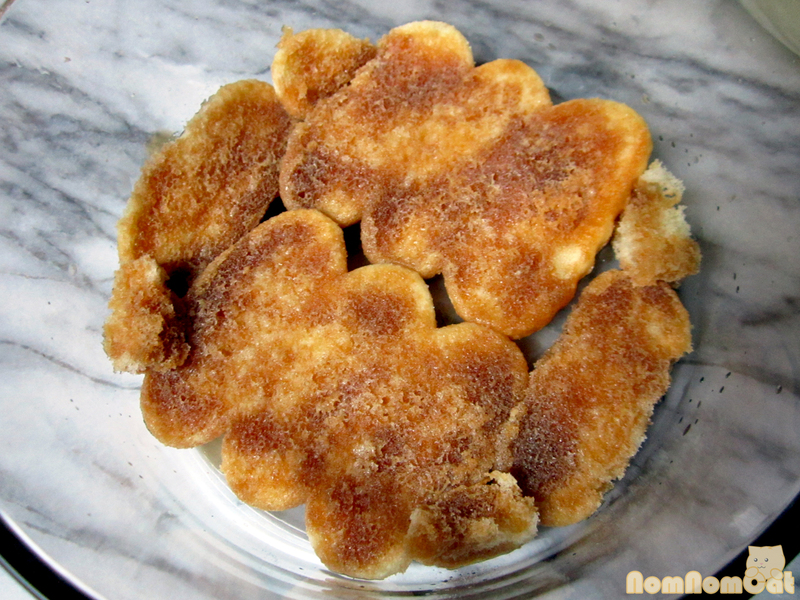 (If you have vanilla bean pods, this would be a great opportunity to use them instead of extract!) 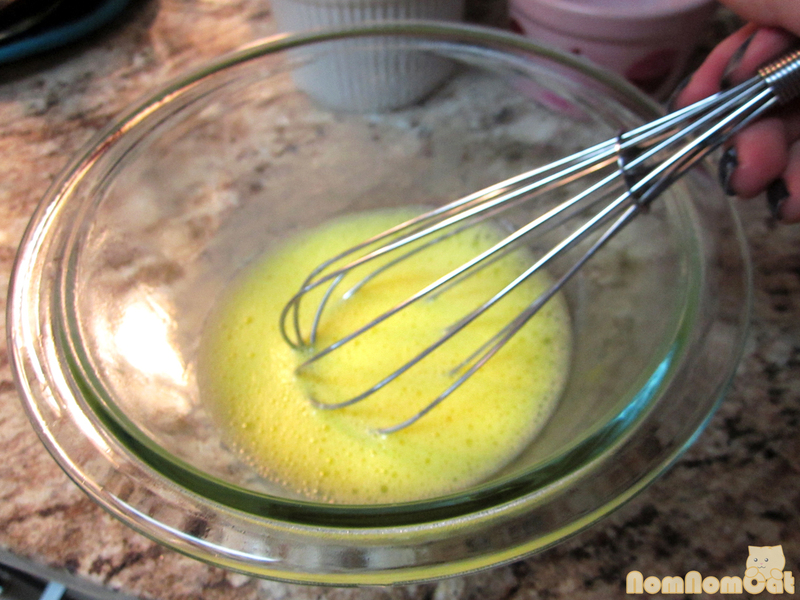 In a separate bowl, whisk the egg yolks and sugar until silky and not grainy. 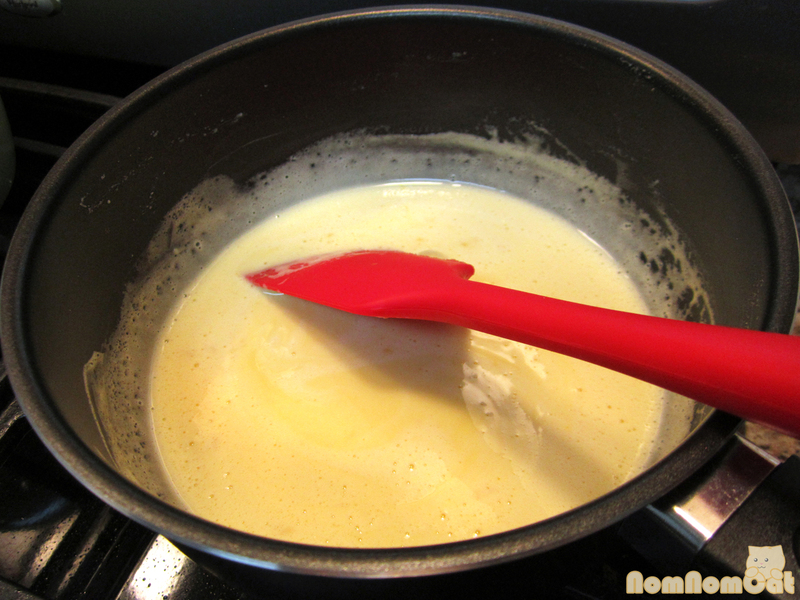 Add a bit of the cream to temper the yolks, whisking constantly or you may end up with scrambled eggs. Return the mixture to the pot and continue cooking until the consistency is substantial enough to cling to the back of a spoon. Set aside. 10) Serve immediately after removing from the oven. Like I mentioned earlier, this method yields a beautiful rise but also a very quick collapse. Break open the soufflé and drizzle in the crème anglaise. 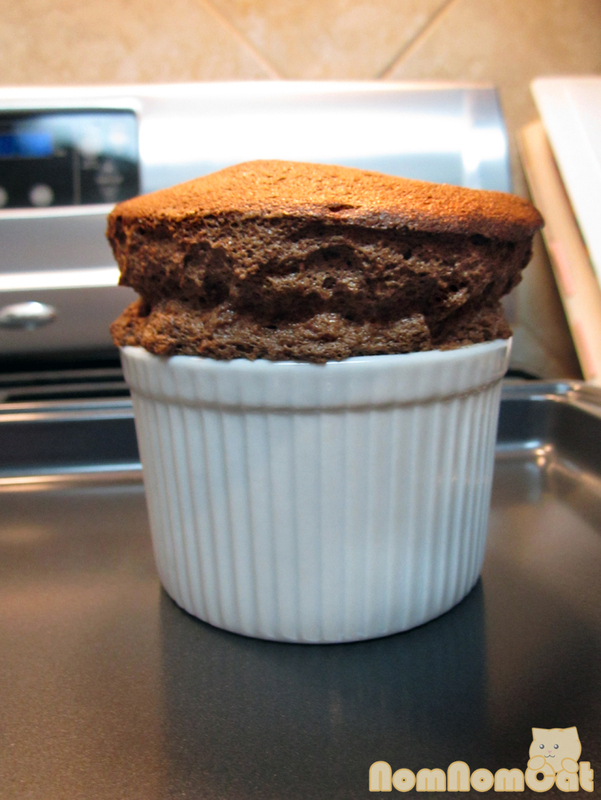 The soufflé has always been a bucket list item of mine, and in the kitchen, it happened to be a wonderful example of my own growing edge – the part of me that yearns to keep learning and trying new things and meeting new challenges. Just as I was basking in the glow of my soufflé accomplishment, I serendipitously received an email from Bunny Eats Design inviting us to participate in the monthly blogging event for Our Growing Edge. So I sat myself down and composed this post. 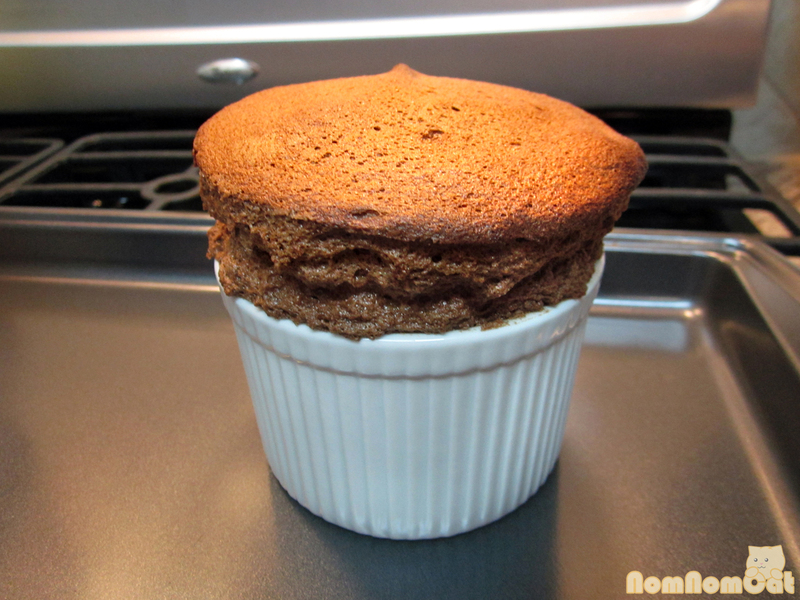 I assure you this will not be my last soufflé, and I hope my post inspires you to try your first (Valentine’s day is just a few days away… hint hint)! Believe me, it can be done and oh, is it satisfying!